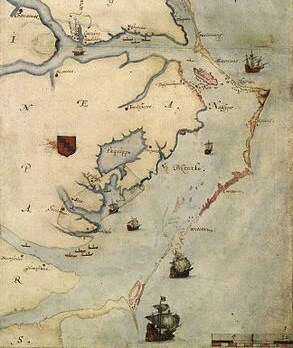 The Roanoke Colony on Roanoke Island in Dare County, present-day North Carolina, United States, was a late-16th-century attempt by Queen Elizabeth I to establish a permanent English settlement. The enterprise was financed and organized originally by Sir Humphrey Gilbert, who drowned in 1583 during an aborted attempt to colonize St. John’s, Newfoundland. Sir Humphrey Gilbert’s half brother Sir Walter Raleigh would gain his brother’s charter from Queen Elizabeth I and subsequently would execute the details of the charter through his delegates Ralph Lane and Richard Grenville, Raleigh’s distant cousin. The final group of colonists disappeared during the Anglo-Spanish War , three years after the last shipment of supplies fromEngland. Their disappearance gave rise to the nickname “The Lost Colony”. Raleigh and Elizabeth intended that the venture should provide riches from the New World and a base from which to sendprivateers on raids against the treasure fleets of Spain. :135 Raleigh himself never visited North America, although he led expeditions in 1595 and 1617 to South America’s Orinoco River basin in search of the legendary golden city of El Dorado. On April 27, 1584, Raleigh dispatched an expedition led by Philip Amadas and Arthur Barlowe to explore the Eastern coast of North America. They arrived on Roanoke Island on July 4,:32 and soon established relations with the local natives, the Secotans andCroatoans. Barlowe returned to England with two Croatans named Manteo and Wanchese, who were able to describe the politics and geography of the area to Raleigh. :44–45 Based on this information, Raleigh organized a second expedition, to be led by Sir Richard Grenville. Grenville’s fleet departed Plymouth on April 9, 1585, with five main ships: the Tiger (Grenville’s), the Roebuck, the Red Lion, theElizabeth, and the Dorothy. Unfortunately, a severe storm off the coast of Portugal separated the Tiger from the rest of the fleet. :57The captains had a contingency plan if they were separated, which was to meet up again in Puerto Rico, and the Tiger arrived in the “Baye of Muskito” (Guayanilla Bay) on May 11. When the Tiger sailed through Ocracoke Inlet on June 26, it struck a shoal, ruining most of the food supplies. :63 The expedition succeeded in repairing the ship, and in early July reunited with the Roebuck and Dorothy, both of which had arrived in the Outer Banks some weeks previous. The Red Lion had been with them, but had merely dropped off its passengers and left for Newfoundland for privateering. :64While waiting for the other ships, Grenville established relations with the Spanish there while simultaneously engaging in some privateering against them,:62 and also built a fort. The Elizabeth arrived soon after the fort’s construction. :91 Eventually, Grenville tired of waiting for the remaining ships, and departed on June 7. The fort was abandoned, and its location remains unknown. After the initial exploration of the mainland coast and the native settlements there, the natives of the village of Aquascogoc were blamed for stealing a silver cup. In retaliation, the village was sacked and burned. :72 English writer and courtier Richard Hakluyt‘s contemporary reports of the first voyage to Roanoke, compiled from accounts by various financial backers including Sir Walter Raleigh (Hakluyt himself never traveled to the New World), also describe this incident. Despite this incident and a lack of food, Grenville decided to leave Ralph Lane and 107 men to establish the colony at the north end of Roanoke Island, promising to return in April 1586 with more men and fresh supplies. 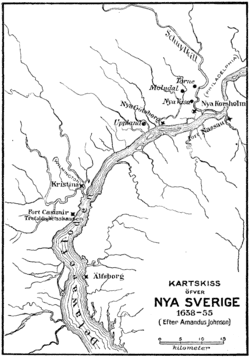 They disembarked on August 17, 1585. Lane built a small fort on the island and ordered the exploration of the surrounding areas. There are no surviving pictures of the Roanoke fort, but it was likely similar in structure to the one in Guayanilla Bay. As April 1586 passed, there was no sign of Grenville’s relief fleet. Meanwhile in June, bad blood resulting from their destruction of the village spurred an attack on the fort, which the colonists were able to repel. :5 Soon after the attack, when Sir Francis Drake paused on his way home from a successful raid in the Caribbean and offered to take the colonists, including the metallurgist Joachim Gans, back to England, they accepted. On this return voyage, the Roanoke colonists introduced tobacco, maize, and potatoes. :5The relief fleet arrived shortly after Drake’s departure with the colonists. Finding the colony abandoned, Grenville returned to England with the bulk of his force, leaving behind a small detachment both to maintain an English presence and to protect Raleigh’s claim to Roanoke Island. They were counting on these men to help with the new colony, but when they could find no one, they gave up hope of ever seeing Grenville’s men alive. The fleet’s commander, Simon Fernandez, now refused to let the colonists return to the ships, insisting they establish the new colony on Roanoke. :215 His motive remains unclear.In 1587, Raleigh dispatched a new group of 150 colonists to establish a colony on Chesapeake Bay. They were led by John White, an artist and friend of Raleigh who had accompanied the previous expeditions to Roanoke. White was later appointed Governor and Raleigh named 12 assistants to aid in Roanoke’s settlement. They were ordered to travel to Roanoke first to gather Grenville’s men, but when they arrived on July 22, 1587, they found nothing except a skeleton that may have been the remains of one of the English garrison. Born in 1560, Thomas Harriot entered Raleigh’s employment in the early 1580s, after graduating from Oxford University. While he did not accompany them on the first voyage, Harriot may have been among the men of Arthur Barlowe’s 1584 expedition of the colony. He trained the members of Raleigh’s first Roanoke expedition in navigational skills and eventually sailed to Roanoke with the second group of settlers, where his skills as a naturalist became particularly important along with those of painter and settlement leader John White. Between their arrival in Roanoke in April 1585 and the July 1586 departure, Harriot and White both conducted detailed studies of the Roanoke area, with Harriot compiling his samples and notes into several notebooks that, unfortunately, did not survive the colony’s disappearance. However, Harriot also wrote descriptions of the surrounding flora and fauna of the area, which survive in his work A Brief and True Report of the New Found Land of Virginia, written as a report on the colony’s progress to the English government on the request of Raleigh. Viewed as propaganda for the colony by modern historians, this work has become vastly important to Roanoke’s history because of not only Harriot’s observations on wildlife, but also his depictions of Indian activities at the time of the colony’s disappearance. In the text, Harriot reports that relations between the Roanoke Indians and the English settlers were mutually calm and prosperous, contradicting other historical evidence that catalogues the bloody struggles between the Roanoke Indians and both of Raleigh’s commanders, Sir Richard Grenville and his successor Ralph Lane. Harriot recounts little to none of these accounts in his report to England and does not mention the disorderly state of the colony under either Grenville’s or Lane’s tenure, correctly assuming these facts would prevent Roanoke from gaining more settlers. Ironically, Harriot’s text did not reach England, or the English press, until the year of 1588, by which time the fate of the “Lost Colony” was sealed in all but name. The end of the 1587 colony is unrecorded, leading to its being referred to as the “Lost Colony”, and there are multiple hypotheses as to the fate of the colonists. There were also reported sightings of European captives at various Indian settlements during the same time period. :250 Strachey wrote in 1612 that four English men, two boys and one girl had been sighted at the Eno settlement of Ritanoc, under the protection of a chief called Eyanoco. Strachey reported that the captives were forced to beat copper and that they had escaped the attack on the other colonists and fled up the Chaonoke river, the present-dayChowan River in Bertie County, North Carolina. :242:222 For four hundred years, various authors have speculated that the captive girl was Virginia Dare. However, the case was far from settled. A similar legend claims that the now-extinct Saponi of Person County, North Carolina, are descended from the English colonists of Roanoke Island. Indeed, when these Native Americans were last encountered by subsequent settlers, they noted that these Native Americans already spokeEnglish and were aware of the Christian religion. The historical surnames of this group also correspond with those who lived on Roanoke Island, and many exhibit Europeanphysical features along with Native American features. However, no documented evidence exists to link the Saponi to the Roanoke colonists. Other tribes that claim partial descent from surviving Roanoke colonists include the Catawba (who absorbed the Shakori and Eno people), and the Coree and the Lumbee tribes. The Lost Colony DNA Project was established to test all of these claims. Chief Powhatan reportedly produced several English-made iron implements to back his claim, but no bodies were found and no archaeological evidence has been found to support this claim, however, and that which was found at a Chesepian village site in Great Neck Point in present-day Virginia Beach suggests that the Chesepian tribe was related to the Pamlico in Carolina, rather than the Powhatans. There were also reports of a Native American burial mound in the Pine Beach area of Sewell’s Point in present dayNorfolk, Virginia, where the principal Chesepian village of Skioak may have been located. From 1937 to 1941, a series of stones were discovered that claimed to have been written by Eleanor Dare, mother of Virginia Dare. They told of the travelings of the colonists and their ultimate deaths. Most historians believe that they are a fraud, but there are some today that still believe the stones are genuine. In May 2011, Brent Lane of the First Colony Foundation was studying the Virginea Pars Map, which was made by John White during his 1585 visit to Roanoake Island, and noticed two patches where the map had been corrected. The patches are made of paper contemporaneous with that of the map. Lane asked researchers at the British Museumin London, where the map has been kept since 1866, what might be under the patches, sparking a research investigation. Under one of the patches, the symbol for a fort is visible when the map is placed over a light box. On May 3, 2012, at Wilson Library of the University of North Carolina at Chapel Hill , members of the Foundation and representatives of the museum announced the discovery of “a large, square-shaped symbol with oddly shaped corners.” This symbol presumed to represent a fort is visible when the map is viewed on a light box. Some scholars speculate that the colonists relocated to that location, on what is now called Salmon Creek in the Bertie County community of Merry Hill. The Scotch Hall Preserve golf course community was planned on the site, but it has not been fully developed. In 1998, East Carolina University organized “The Croatoan Project”, an archaeological investigation into the events at Roanoke. The excavation team sent to the island uncovered a 10-carat (42%) gold 16th-century English signet ring, gun flints, and two 16th-century copper farthings at the site of the ancient Croatoan capital, 50 miles (80 km) from the old Roanoke colony. Genealogists were able to trace the lion crest on the signet ring to the Kendall coat of arms, and concluded that the ring most likely belonged to one Master Kendall who is recorded as having lived in the Ralph Lane colony on Roanoke Island from 1585 to 1586. If this is the case, the ring represents the first material connection between the Roanoke colonists and the Native Americans on Hatteras Island. It is also believed that the reason for the extreme deficiency in archaeological evidence is due to shoreline erosion. Since all that was found was a rustic looking fort on the north shore, and this location is well documented and backed up, it is commonly believed that the settlement must have been nearby. The northern shore, between 1851 and 1970, lost 928 feet because of erosion. If in the years leading up to and following the brief life of the settlement at Roanoke, shoreline erosion was following the same trend, it is likely the site of dwellings is underwater, along with any artifacts or signs of life. The Lost Colony DNA Project, launched in 2005, is an ongoing effort underway by the Lost Colony of Roanoke DNA Project at FamilyTreeDNA of Houston, TX. The project will use DNA testing to help determine whether some Lost Colony survivors assimilated with the local Native American tribes either through adoption or enslavement. The project will attempt to locate and test as many potential descendants as possible. Testing is also planned for some of the recovered remains. In 1998, a team led by climatologist David W. Stahle, of the University of Arkansas, Department of Geography, in Fayetteville, Arkansas, and archaeologist Dennis B. Blanton, of the Center for Archaeological Research at The College of William and Mary in Williamsburg, Virginia, used tree ring cores from 800-year-old bald cypresses taken from theRoanoke Island area of North Carolina and the Jamestown area of Virginia to reconstruct precipitation and temperature chronologies. The researchers concluded that the settlers of the Lost Colony landed at Roanoke Island in the summer of the worst growing-season drought in 800 years. “This drought persisted for 3 years, from 1587 to 1589, and is the driest 3-year episode in the entire 800-year reconstruction,” the team reported in the journal Science. 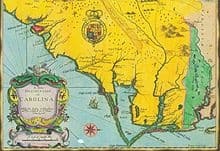 A map shows that “the Lost Colony drought affected the entire southeastern United States but was particularly severe in the Tidewater region near Roanoke [Island].” The authors suggested that the Croatan who were shot and killed by the colonists may have been scavenging the abandoned village for food as a result of the drought. Pulitzer Prize -winning playwright Paul Green wrote The Lost Colony in 1937 to commemorate the 350th anniversary of the birth of Virginia Dare. The play presents a conjecture of the fate of Roanoke Colony. It has played at Waterside Theater at Fort Raleigh National Historic Site on Roanoke Island nearly continually since, with the only interruption being during World War II. Alumni of the cast include Andy Griffith (who played Sir Walter Raleigh), William Ivey Long, Chris Elliott, Terrence Mann, and The Daily Showcorrespondent Dan Bakkedahl. Giles Milton‘s 2013 children’s book, Children of the Wild, is a fictional recreation of the Roanoke colony, as seen through the perspective of four child colonists.